Protests are always a magnet for the media. Scuffles make great pictures for TV, chants make great sound for radio; the mass of people suggesting some great social movement. Why should multimedia be any different? It was no surprise all the big news organisations were employing blogs, twitter, online audio and video for today’s G20 protests. They’ve used them on news stories several times over the past few months. What I think makes today different is this is the first time newsrooms have had significant warning of a news event, to flex their multimedia muscle and see what it’s capable of. Immediately popular was BBC News’ interactive map which appeared mid morning. 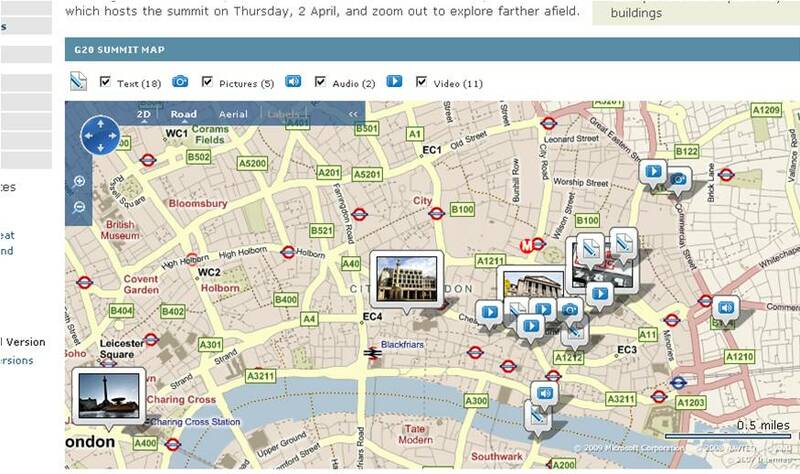 The movable image covered central London, and as reports from the ground were filed, they appeared on the map. The stories were multimedia; everything from text, audio, video and images. The Guardian were out in force at the protests, with journalists employing all sorts of technology to help them in their quest. One of the favourites was the new audio sharing site Audioboo, unique from places like Soundcloud and Mixcloud in that it only really works if you have an iPhone. 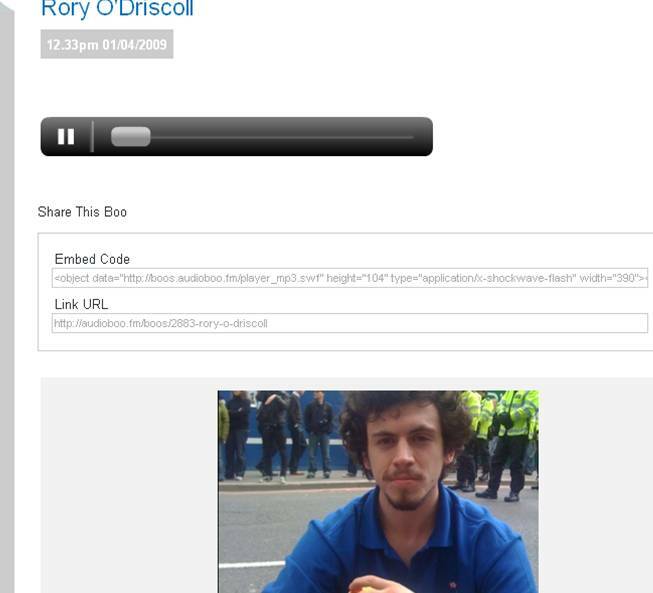 So excited were Guardian journalists by this new technology it seemed they were happy to upload all and every interview they conducted, including the one pictured, with Rory O’Driscoll. “Sorry, were you expecting some a little more, err, involved?” he told the reporter, clearly not at all bothered about what was going on. Someone (on Twitter in fact) commented, on seeing this image, that there must have been more journalists on the streets than protestors. What these provide though, were unfiltered, immediate dispatches from the scene. Stuck in an office, those of us in Web 1.0 world were forced to watch Dermot Murgnahan and the rest of the Sky News reporters stumble their way through the protest. “Oh look, a policeman’s fallen over” was just one remark, along with a car-crash interview with Russell Brand, the comedian who’d clearly taken the wrong turning on his way out to get some milk. These Guardian dispatches though – raw, mispelt, abbreviated into 140 characters, gave you the very latest – and of course they’ve not been through an editor. Who said any story couldn’t be told in 140 characters or less? The BBC had a similar live update system with similar benefits. This one though included chosen comments from viewers/listeners as well as BBC correspondents (and in some cases media students) on the ground. It looked good, and continued until 2100…but I’d wager cost a lot more than any other news organisation would manage. So lots going on, and it felt – for once – there was more to be seen online than on TV. Has this set a precedent? I hope so. Throughout today, no-one was tweeting/blogging about the G20 coverage they heard on the radio or seen on TV. They were sharing links to sites like the above ones. The key benefits: immediacy, raw information, and interactivity. But for that, do I feel the coverage of the protests was any better than the old media? Hmmm, that’s not so clear cut. I’m amazed mainstream broadcasters haven’t developed a documentary looking at the history of the internet – it is afterall the most important tool since, I dunno, electricity probably. Until they do, there’s a few decent shorts online – including this one I just discovered on Vimeo. Could do with a bit more humour, but the graphics are nice and I learnt the idea of networking computers goes back to 1957, not the 1970s as I always thought. The “future of news” is appearing more and more in public debate and discussion I’m glad to say. On the same day I published my own thoughts, Richard Sambrook spoke to students at City University on the subject. And a pretty cool debate took place at the Web 2.0 summit, with Current TV and Twitter both talking about how social media will be driving force in the future of news. You can see details here. 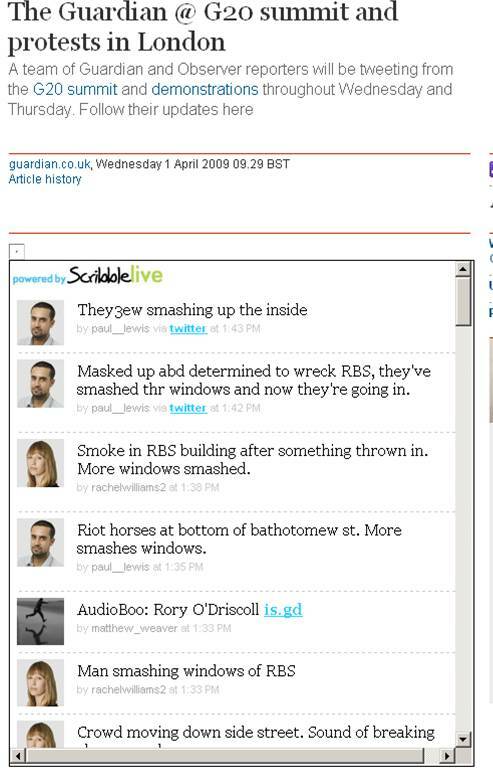 In particular, Current have trialled running a strap with live Twitter updates onscreen during live broadcasts. I like. What japes we get up to on the City journo course in London. This week, in preparation for our weekly TV news programme fellow student Neil was asked to go an make a short you-tube style film in the snow, to illustrate a news story about UGC. The result has been bluetoothed across Islington and is now on the web – hilarious through accident rather than design. It gets funnier the more times you watch it. For some, there’s nothing more frustrating than calling a UK helpline only to find the call directed to India. It’s something we’ve all come to expect from the big banks and insurance companies. But the news agencies? Surely not. So I was surprised to read an article on BBC News Online about the internationally respected Reuters news agency outsourcing it’s Wall Street financial coverage…to Bangalore. The latest financial information from the trading floors in New York will now get to the business people who need it in New York (and London, Paris, Berlin etc) via India. Like our beloved call centres, the sub continent outsourcing is for financial reasons. So is the largest financial news agency in the world becoming a cheap skate? Maybe so; if the journalists in Bangalore are trained to the same standards then there’s no worry. Perhaps its another example of the ever shrinking world that this information can go out before it comes back in. And if it allows more quality journalism to go ahead then I ain’t complaining. I just won’t be calling the Reuters helpline anytime soon. Now I try and keep an eye out for these sort of things, and I haven’t found a genuinely surprising and stereotype-overturning piece about anywhere or anything in Africa since the excellent Inside Africa films I blogged about ages ago. In fact the only people out there fighting Africa’s corner are the armies of bloggers like E.K. Bensah and Sociolingo – if you read their blogs (and I strongly urge you to do so) you’ll see a different side to the continent; a far cry to the famine, disease and war western newspapers and broadcasters would often have us believe. Which is why it’s such a great surprise to see “Kenya’s Mobile Revolution” coming up next week on Newsnight on BBC 2 in the UK. As part of BBC Newsnight’s Geek Week 2.0, they’re showing a film made by their tech reporter Paul Mason. He travelled to Kenya to see how mobile phones are literally changing every aspect of people’s lives. Two mobile phone companies have created an 80% network coverage of the country – which I’m sure is better than in the UK! – and even the Maasai nomads in the Rift Valley are texting each other. Even more, mobile operators are pioneering services yet to appear in Europe, like being able to send someone else cash with your mobile. More and more people are getting them and Paul Mason reckons the mobile could be a democratising tool in a country where the ruling elite’s rife with corruption. 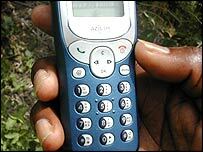 When I was last in Ghana back in 2003, I noticed people were using mobiles; hawkers sold mobile phone covers on every street corner. Ironically, I refused to take a mobile phone out there, but if I had, I would have had constant coverage. So if you’re in on Monday night, watch it. If you’re not, Sky + it. But being the techno-savvy lot you are, I’m sure you’ll watch the online preview now available. It’s 18 minutes long but well worth it. Think you’ve got a lot of time on your hands? Nothing I have seen on this earth (save the Sistene Chapel..which actually I haven’t seen) have required the time, imagination and sheer patience of these two youtubeauties. Thanks to Shall for the tip!